Rainbow Eagle is an Okla-Choctaw American Indian. His full-blood father was registered with both the BIA (Bureau of Indian Affairs) and the Choctaw Nation of Oklahoma. Rainbow Eagle (Rolland J Williston) has been honored with the responsibility of an Ancient Native American Peace Shield drawing which was hidden away in order to be available to all humans after the lighting of the Seventh Fire. These teachings were handed down to him by one of the last Peace Shield Teachers during two winter visits in upper Michigan in the early 1980s. Now that the Seventh Fire of the Anishinabe/Ojibwa traditions has been lit, he is responsible for teaching the traditions and spiritual guidance of the Peace Shield. Prophesy foretold that in the Seventh Fire time there would be a "New People" who would seek the ancient wisdom in order "to help bring the human family back together again" and "to come into relationship with all life everywhere", including life in the cosmos. At this time, the traditional wisdom and truths of this Peace Shield drawing are to be offered to facilitate a greater understanding of the Great Creator's Divine Plan and to help restore peace and harmony upon our Mother Earth. 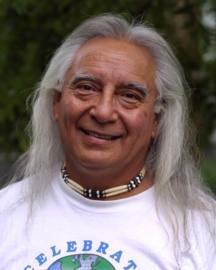 Rainbow Eagle has spent most of his life traveling and being among traditional Native Americans, both on and off reservations in the United States and Canada, sharing with traditional people and learning from their most respected elders. He is a revered storyteller and teacher who has shared his knowledge in both traditional and non-traditional ways with many communities across North America. His teachings have taken him to Sweden, Finland, Denmark, Germany, and Italy. Rainbow Eagle follows a vision given to him by the Great Mystery to teach. He and his wife are a leaders of many traditional ceremonies and are responsible for Sacred Bundles. 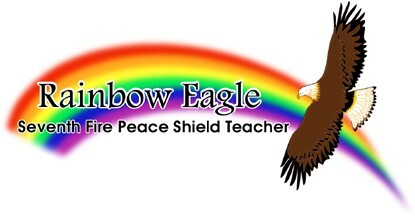 Rainbow Eagle has passed the Peace Shield Teachings to five others who will help carry on these teachings throughout the Seventh Fire. Rainbow Eagle's second book, "Native American Spirituality: A Walk in the Woods" (now in a special revised edition) includes teachings related to Native American spirituality, Peace Shield teachings, prophecies of both North and South America and spiritual guidance about getting ready for Cosmic Relationships. Rainbow Eagle was honored to participate in the International UFO congress in 2011. 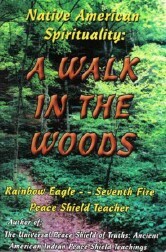 Buy "A Walk in the Woods" by contacting Rainbow Eagle at [email protected]. Overseas orders can be arranged through Amazon.com. Opportunities for face-to-face teachings can also be requested. Rainbow Eagle's third book, "The Ancient Roots Of Christianity: A Native American's Look Through Christianity", is also available. His view is that "Until we have the courage to ask questions about our spiritual roots, whether they are from a Christian, Native American or other tradition, we will remain separated from our true spiritual identity." In reference to Christianity, "it's not about finding the most pure form of Christianity; but more about how each individual can experience Yeshua personally." Buy "The Ancient Roots Of Christianity" by emailing Rainbow Eagle directly at [email protected]. "Rainbow Eagle exemplifies the highest spiritual qualities of universal philosophy. He teaches with authenticity, integrity and honor. His new book, 'Native American Spirituality: A Walk in the Woods', establishes a solid foundation to build a dynamic optimistic future for humanity." "A Walk in the Woods stimulates healing and hope as wisdom is gathered from both Rainbow Eagle's personal experiences and the sacred wisdom of the ancients. Certainly contemporary seekers who have always known deep within them that there is more to life than has been revealed, will rejoice. As we individually recover such awareness we may come to honor humanity's diversity ande develop loving trust in the Great Mystery." "Rainbow Eagle is a gifted teacher of universal knowledge who walks in harmony with the Universe. He brings us the spiritual wisdom of ancient teachings of Love and Respect for all Creation."